Rhapsody yesterday announced the acquisition of long term rival Napster from US retailer Best Buy. Rhapsody will retire the Napster brand and migrate the customer base over to its own service, with Best Buy gaining a minority stake in Rhapsody. It is a somewhat poignant end to one of digital music’s old guard, going out with a whimper rather than a bang. The acquisition will give Rhapsody an important boost in scale at a pivotal time, namely as Spotify aggressively grows its US subscription business and simultaneously disrupts the entire market with its introduction of free on-demand music to the US market (a ship which of course MOG and Rdio are also busy jumping on). In the near-term the Napster acquisition will put more clear water between Rhapsody’s subscriber count and Spotify’s. It should also grant Rhapsody membership of the the ‘1 Million Club’, with its 800,000 subscribers swelled by a few hundred thousand from Napster. The last time Napster reported their numbers in December 2008 they had 700,000 subscribers. After three years in the Best Buy wilderness and shifts towards bundled download products I estimate there to be no more than 400,000 fully fledged subscribers left, probably more like 300,000. But Rhapsody will be keenly aware that even keeping hold of just 300,000 subscribers will be no mean feat. They will remember keenly the 2008 acquisition of Yahoo! Music’s 400,000 subscribers and their rapid disappearance into the ether. Napster will also recall the similar magical disappearing trick of the 350,000 AOL Music Now subscribers they acquired in December 2007 for $43 per subscriber. In the business of acquiring music subscribers 2+2 too often = 2.5. Rhapsody’s President Jon Irwin said of the acquisition that “scale is extremely important in this business.” He is of course entirely correct. Rights fees leave little in the way of margins. 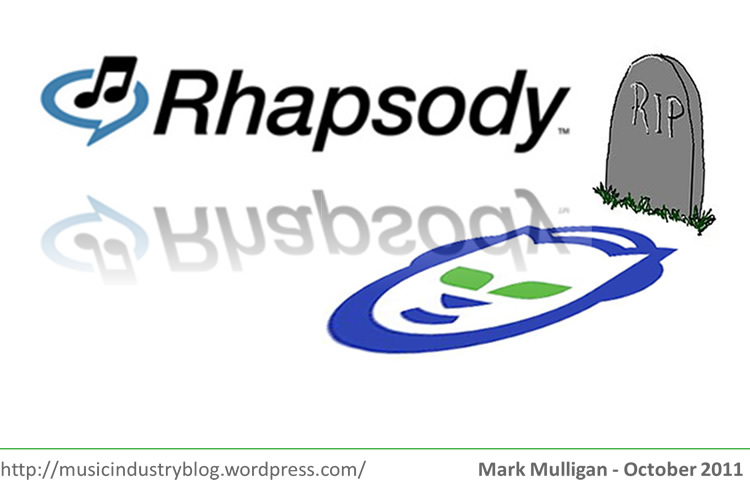 For sake of full disclosure I’ve been a very long term fan of Rhapsody, right since their earliest days. It was partly our experiences of Rhapsody that led myself and my former colleague David Card to be so bullish about music subscriptions when we were helping build the Jupiter Research digital music forecasts. But the time has come for Rhapsody not just to change but to drive change. The digital music market is a different world from that Rhapsody was built for. Unless Rhapsody wants to be limited to spending the next year or two simply trying to stay one subscriber ahead of Spotify it needs to overhaul its product roadmap. Rhapsody needs unlimited MP3, now! I’ve long advocated that if the record labels really want to ensure the extant premium subscription services don’t become extinct that they must empower them with dramatically more powerful licenses: namely unlimited MP3. Of course it will be a good year or two more of global music revenue decline before the labels hurt enough to really countenance unlimited MP3, but Rhapsody needs it now. So what can Rhapsody do in the meantime? Well they’ve already got great discovery and editorial etc. so it is not really the experience they need to fix, rather the entire value proposition. They need to ask themselves ‘what do we want to mean to consumers in the Spotify age? What can makes us dramatically and unmistakeably different?’ Unless they can really address this fundamental question Rhapsody will face the very real prospect ending up looking like Spotify’s stuffy old uncle, which would be a criminal insult for the Grand Old Lady of digital music. Click on the video below to view my latest Music Industry Blog podcast. This episode addresses the Socially Integrated Web, the term I use to describe Facebook’s content strategy. So Apple finally launched their much anticipated cloud music service, and they didn’t disappoint. At least by cloud-locker standards they didn’t. But I wanted more, a lot more. What is it? 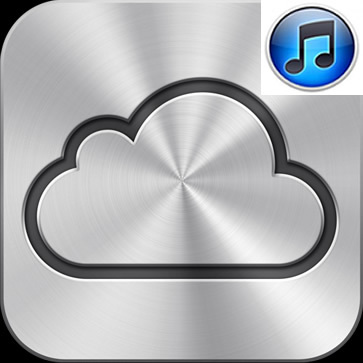 Enables iTunes buyers to transfer music purchases to any iTunes supported device of songs that you have bought from iTunes. How much of a big deal is it? This is a welcome move, but one that really should have happened long ago, and it’s entirely not Apple’s fault it took so long. The music industry still thinks of digital music on a per-device basis. But restricting the devices people can take their purchased music on only weakens legal services when compared to illegal ones, which of course have no such qualms. Thinking of music consumption on a device basis rather than a person basis is simply the wrong worldview and it needs to change, fast. Automatic Downloads are nice move towards a new way of thinking, but of course within the tightly controlled confines of the iTunes ecosystem. What is it? Matches your music collection against Apple’s cloud catalogue and upgrades your music to 256 kbps AAC, all for $24.99 a year. How much of a big deal is it? This is the sort of locker service Amazon and Google *should* have launched. Instead of having to painfully upload your entire music collection you simply need to scan and match, a process which should take a matter of minutes. It makes a cloud collection a seamless extension of your local collection. Mulligan’s Take: With these simple but elegantly executed features Apple has created a best-of-breed cloud / music store combination that makes much of the competition pale by comparison. Apple has done what Apple does best: it has let the competition move first, learned from their mistakes and launched a better product. And yet it is it enough? Apple have done more than enough in terms of the current cloud-storage debate, and this is a clear shot across the bows of Google and Amazon’s burgeoning digital music ambitions. Also, make no mistake, Apple will have worked hard to get what they have from the rights holders to get this service to market. But it doesn’t do half as much as it could do, to move the digital music conversation on beyond the ‘distraction’ of locker services. That is of course a lengthy wish-list and one that won’t be fulfilled anytime soon. But nonetheless that is the sort of thing the record labels need to encourage Apple, Google and Amazon to build over the next few years if they are going to get digital music out of its current impasse. One again, continuing my bid to provide more fuel for the ‘music should be free’ fire this is the third in my short series of ‘Music Myths, Misconceptions and Mistakes’ posts, tackling one big ‘free’ issue at a time. Today’s topic is Subsidized* (the previous two posts can be found here: Part 1: File Sharing Part 2: Ad Supported). 1. Misconception: subsidized offerings will not further erode consumer perceptions of music as a paid commodity. 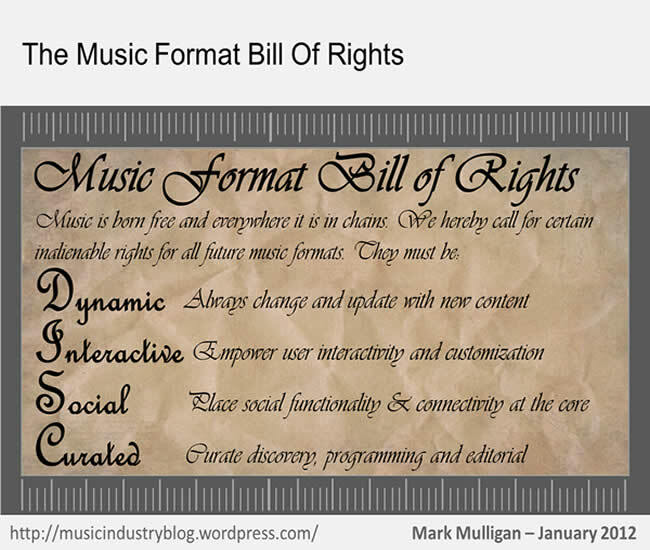 Whatever the restrictions on marketing (see #2) consumers are smart enough to perceive CWM as being free music: they pay nothing for the music and the device costs the same as without the music. 2. Mistake: not calling CWM ‘Free’ or ‘Unlimited’. ASA concerns for the latter, and label imperatives for the former, mean that CWM cannot be marketed to its strengths. The effect described in #1 will happen regardless of whether the messaging is overt. Weakening the message will only weaken consumer adoption. 3. Myth: Subsidized offerings are a necessary but ultimately short-term tool for driving digital music adoption . A whole digital generation has grown up with no concept of paying for music online. Those habits are engrained. Free, subsidized services, and ad supported, will become permanent features of the digital music landscape. 4. Mistake: Managing consumer life cycles. Make no mistake, lots of mistakes will be made (!) as the industry learns how to manage these services. One of the biggest challenges is correctly segmenting users into those who will never pay, and those who can be migrated up the food chain. 5. Mistake: Positioning. Services like CWM and PNp can’t be allowed to be too successful – they need to be focused on core target consumers (e.g. young file sharers) and not be widely adopted by strong music buyers, else their spend will be cannibalized. 6. Myth: CWM and PNp will revolutionize the digital music market in the next 5 years. These services are vastly important (arguably the biggest thing to happen to the music industry in years) but their core impact will be longer term. Near term growth will be slowed by geographic roll-out, consumer awareness / education, handset replacement cycles, value-chain tensions. 7. Misconception: Subsidized offerings will not cannibalize premium digital spending. As long as targeting is kept tight, negative impact on spending on operator OTA services and online stores should be minimal, but it will decrease a little, though overall revenues will increase due to licensing income. 8. Misconception: Consumers will not ‘max-out’ these services. TDC’s Play service has had phenomenally high usage rates (see my post here for details). When people get unlimited access to free music, they use it! 9. Mistake: Not having licensed to fully subsidized offerings sooner. CWM etc. are the best tools the music industry has to fight file sharing with. They should have licensed to them sooner. 10. Mistake: If licensing terms don’t enable Nokia etc.to make money. If fully subsidized service business models are not financially viable (which doesn’t necessarily mean profitable BTW) their current proponents will eventually move onto something else, leaving what will be a gaping hole in digital music provision, which will quickly be filled by illegal free alternatives again. When questioned at a conference recently, MySpace Chief Executive Chris DeWolfe suggested the social network would consider launching an MP3 player some time in the future, thus going head on against Apple. It might sound like a logical next-step but it’s not. The reason MySpace has become so important to the music value chain (both for digital and broader discovery/marketing) is because it has a distinct place. MySpace, like imeem, Last.FM, Pandora etc. works well because it is an explicitly online, consumption and discovery based experience. The launch of the new streaming content pushes it even further in that direction. MySpace doesn’t suffer from the endemic DRM constraints and controversies that mire download services. And because it is free it doesn’t have to develop a value positioning either. In its free, online guise, MySpace sits as an entirely complementary asset alongside the iTunes / iPod combination. Sure Apple might be (ever so slowly) starting to steal some of social music’s clothes (cf Genius) but its focus remains devices and downloads. As soon as MySpace starts trying to fight Apple on Apple’s home turf, they’ll find themselves having to reinvent and reinforce their value proposition from the foundations up. Consumers tolerate the various quibbles and glitches that are an accepted companion to MySpace as a free, online destination. But those standards aren’t good enough for a paid offering. When MySpace finally launches its own download store it will need to refine its music DNA, a need which will become more fundamental if an associated device strategy is pursued. But I fear MySpace will shy away from the requisite comprehensive rethink even for the download store and simply launch it and hope/expect it to succeed. If they do so, and launch a device in a similar fashion, then MySpace will sow the seeds for long-term decline. For now MySpace would be well advised to read up on how well Napster’s branded MP3 player strategy went….remember that? Exactly.